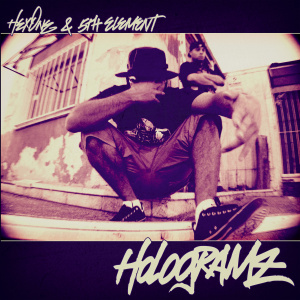 „Another benchmark for Hip-Hop duo Epidemic’s Hex One, Hologramz pairs the hungry MC with an old friend, Mic Theory affiliate, and equally voracious producer: 5th Element. With the two not having worked on any new material together since 5th and Epidemic’s debut album Illin‘ Spree back in 2011, this project aims to recapture the essence that first brought them together 3 years ago. It features production that predates their debut album with some beats from as far back as ’06-07, as well as some fresh new bangers from 2014. The album is very feature heavy with guest appearances on 8 of its 11 tracks including MC’s such as Ruste Juxx, Planet Asia, Prince Po and of course Tek-nition as well as many others. The majority of the songs consist of the signature sound this MC/producer team in known for: lyrical murder, however many of them also have concept based themes and a good chunk of the album deals with real life issues such as greedy backstabbing friends and the struggle to make it through rough times. Tracks such as „Fire“ featuring Tek-nition and Planet Asia for example, have the three MC’s referencing different forms of fire as they tear the beat to shreds. Others like „Speeding“ featuring Prince Po and Awon, use cars and the road as a metaphor for some of the hardships many of us go through in life. „Deep Cover ’14“ is a tribute and remake of Big Pun’s „Twinz“ track, with Hex recreating the same rhyme schemes using all different words, while „Rare Form“ featuring Reks, MindsOne, Ty-One and Teknition, offers a track full of no-nonsense straightforward spitting. Hologramz has a run time of a little bit over 40 minutes, so it’s short enough to keep your attention throughout, yet long enough to be a substantial listen.